The Building Love campaigned received a boost in June thanks to a $20,000 donation from ARC. The concrete reinforcement specialists work closely with Clarendon Homes, a longtime supporter of both Ronald McDonald House Westmead and the Building Love campaign. ARC’s generosity brings us one step closer to the Building Love fundraising goal, and the completion of the new, expanded Ronald McDonald House Westmead, which will accommodate more than 1,300 families each year. 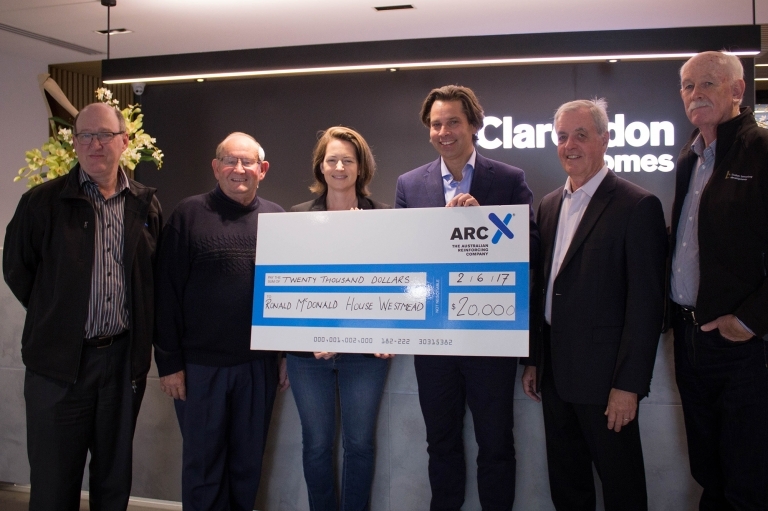 "Given our close relationship of 15 years with Clarendon Homes, ARC is proud to have been asked to join them in supporting Ronald McDonald House Westmead,” said ARC’s General Manager, Sean Mannering. Ronald McDonald House Westmead is an independent charity, primarily relying on donations from the community. Helping provide a much needed ‘home away from home’, every dollar raised from the Building Love campaign will go directly towards the new House and providing support for families so they are able to stay together during one of the most difficult times of their lives. In the last two years, every donation of funds, labour and equipment has brought that dream closer to being complete, but the Building Love Campaign is still $2 million dollars away from its completion target.